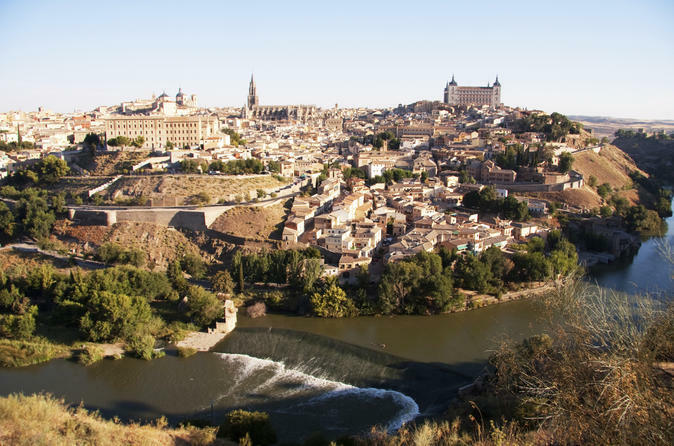 Discover the fascinating city of Toledo, once home to the great painter El Greco, on this tour from Madrid. Immerse yourself in a melting pot of three cultures -- Christian, Muslim and Jewish -- and choose from two itineraries for a day full of historic Gothic cathedrals, cultural sightseeing, Spanish tapas and wine tasting. Visit Primate Cathedral of Saint Mary of Toledo, Church of Santo Tomé and Sinagoga de Santa María La Blanca and a local mosque. At lunch, choose between having free time to wonder around the city or pre-book this tour including a Spanish meal at a local restaurant. Your tour will conclude after travelling to a local winery where your wine-tasting session will take place. Your first stop is Primate Cathedral of Saint Mary of Toledo, a Roman-Catholic cathedral that’s one of the three 13th-century High Gothic cathedrals in Spain. As you explore the exterior, your guide will point out how the architecture shows all the stages of Spanish Gothic style. Then continue with a visit to Sinagoga de Santa María La Blanca (Synagogue of Saint Mary the White), where you'll spend time admiring the interesting arches designed in the damascene technique, which involves the incrustation of precious metals in steel. Continue your tour visiting the interior of the cathedral. You'll soon discover why many experts consider this the best example of Gothic architecture in Spain as you admire a large number of artworks including stained-glasses windows, altarpieces and El Greco paintings. Next, visit Valmardón Mosque or Mosque of El Cristo de la Luz (also known as Bib-al-Mardum Mosque). Delve into the Muslim history of one of these mosques on a guided tour. After a morning in Toledo, depending on your selected option you will have free time to wonder around the city or make your way to a local restaurant where you will enjoy a Spanish meal (see menu options in the itinerary section). You will after meet your guide at the agreed departure point and travel to the city of Bargas, home to the Finca Loranque winery where you will enjoy a wine-tasting session at the wine cellar to get a taste of local Spanish wine. Sample three wines paired with an appetizer while learning about the production of wine in Spain from your guide. Once the tasting is over, you will head back to Madrid where your tour started.